From the Mays Gilliam == Barak Obama department... Devin the Dude and the Coughee Brothaz @ Emo's on Oct. 17th! 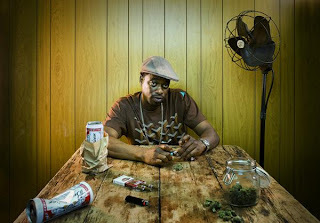 Devin Copeland, better known by his stage name, Devin the Dude, is a Houston hip hop artist, best known for his exceptionally unique rapping style, and his long career signed to Rap-A-Lot Records. The New York Times has called him "A brilliant oddball with a spaced-out flow." Copeland started out as a member of Odd Squad, a group of rappers signed to Rap-A-Lot Records. The label is notable for being the home of hip-hop artists such as Geto Boys, Scarface, and Too Much Trouble. Copeland has released five solo albums: The Dude (1998), Just Tryin' ta Live (2002), To tha X-Treme (2004), Waitin' to Inhale (2007), and Landing Gear (2008). In 2008, Devin ended his 15 year relationship with Houston based Rap-A-Lot Records because the label failed renew his contract. Later that year, Devin signed with indie label Razor & Tie.